It may initially seem a little counter-intuitive in these days of increasing student numbers and reduced budgets to propose a more personalised, ‘boutique’ approach to library services in higher education. But as the role of libraries continues to become more about people rather than information, it makes perfect sense. Generic services are of little interest to the user when compared with offering benefits which can fulfil specific and individual needs. Traditionally adopting a user-focus typically involves putting the user in the centre of the model. But Priestner & Tilley argue that this is unnecessary in the boutique approach as firstly, it goes without saying, and secondly, users should not need to understand or know about behind the scenes elements and relationships, but instead be presented with a seamless front-of-house experience. This is the real starting point of boutique culture. The chapters blend theory and practice through in-depth discussion, whilst the series of case studies highlight myriad ways in which the approach can be implemented in day-to-day services. Priestner stresses the value of face-to-face communication with individuals - often viewed as an unaffordable luxury. However, connecting and engaging with our users in this way should form the very basis of service delivery. After all, how can we know what are users really want and need if we don’t spend time with them? Jane Secker discusses applying boutique principles to research activities in LSE, and the implementation of personalised digital literacy and research skills training (including a list of useful strategies for engaging researchers). Chris Powis considers how boutique teaching and training can enhance learning through increased flexibility, the use of feedback and most importantly, knowing your learners. David Streatfield looks at how we can assess and measure performance in a boutique context by focusing on the real impact of services on our users. The obvious question is how much does this approach cost? Elizabeth Tilley discusses the potential implications for staff time, resources and finances and suggests that cost-effective strategies can be deployed by building a culture of innovation, rigourous service design, generating added-value and eliminating time-wasting. The boutique approach is about building and developing an overall culture rather than introducing quick wins or changes overnight. It can potentially make a difference in helping academic librarians to secure their value over the longer-term by ensuring that services remain aligned with existing and emerging user needs. But more importantly perhaps, it can also help to communicate this value, ensuring the library remains both relevant and visible. 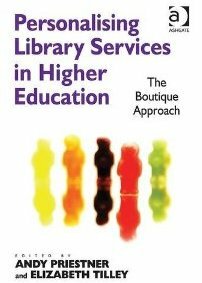 Personalising LibraryServices in Higher Education is published by Ashgate, September 2012, £55. A blog also accompanies the book.